The Providence Chapter of the Awesome Foundation for Arts and Sciences has selected Matt Grigsby to receive its February award. Grigsby will use the Awesome Foundation Grant to create a “Materials PettingZoo” showcasing textile, industrial, consumer products and residential construction materials that offer ecologically sensible solutions to more traditional products. Moving beyond descriptions and pictures of such materials, the materials zoo will encourage participants to touch, feel and directly interact with a variety of materials, offering a novel and interactive way to help people of all ages get educated and exposed to spectacular sustainable materials. Grigsby, an industrial designer and sustainability expert, has been collecting and investigating sustainable materials for years. With this grant, Grigsby will expand his collection and improve the design of his mobile “zoo” so that it can be displayed in more locations and at events across the city. 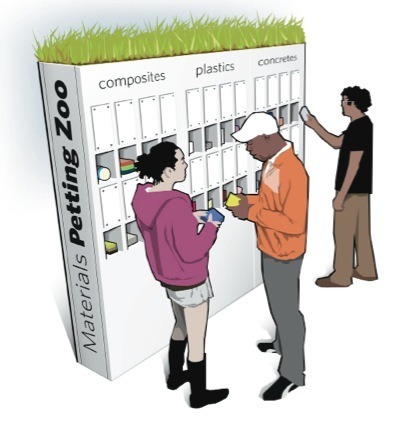 Each sample in the PettingZoo is accompanied by an information card that discusses the material or technologies’ sustainability attributes, manufacturing notes, performance specifications, cost, and information about where to purchase. With support from the Awesome Foundation, Grigsby hopes to excite, inspire and educate the community in Providence about a wide variety of exciting environmental materials and local resources for sustainability. “We are aiming to boost awareness of available options for materials and get the community engaged in many of the great cost effective, high-quality eco material and technology solutions out there. These materials and technologies can be used by home owners, contractors, the business community, designers, artists, architects, and anyone else who might need to use a material for any type of project,” he says. Matt is an Industrial Designer, entrepreneur, and sustainability expert. He oversees operations and partnerships at Ecolect, the worlds leading materials library and design firm devoted to utilizing ecologically minded materials and technologies. Ecolect consults to help others in industries such as Architecture, Product Design, and Engineering do the same. His firm has collected the best available information on the leading sustainable materials available today. They catalog everything from responsibly-sourced plywood, to low impact inks, recycled non-toxic plastics, and much, much more. He has successfully completed projects for companies including Hasbro, LG Electronics, and Schick. His work has appeared in media outlets such as the BBC, Metropolis, Dwell, Make, Architectural Digest, TreeHugger, Planet Green, and Core 77.